Located inside the Hoge Veluwe National Park, the Kroller Muller Museum is a must visit for every art lover. On display at the museum are a world-famous painting and sketches from the 19th and 20th century. Not only that, the museum also has an expansive collecting of works of art by Vincent van Gogh. Additionally, on display are masterpieces by famed artists such as Pablo Picasso, Claude Monet and Georges Seurat. 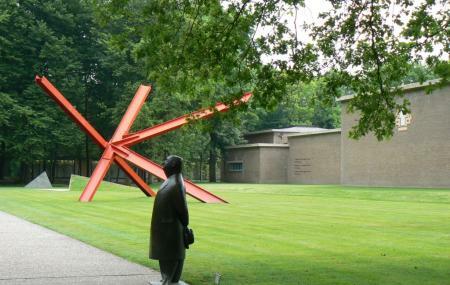 The museum also boasts of having Europe’s largest sculpture gardens. Entry fees include entrance to the Hoge Veluwe National Park as well as the museum. On presentation of student card / student card. Parking charges are applicable as well. The sculpture garden is open only till 4:30 pm. Bus number 106 to Otterlo halts outside the museum. How popular is Kroller Muller Museum? People normally club together Papierfabriek De Middelste Molen and Hoge Veluwe National Park while planning their visit to Kroller Muller Museum. A fantastic museum, makes for a great day out. The museum has a good and diverse collection in a worthy building. It has a very large sculpture garden as well, and the entire thing is located in on of the largest national parks of the country. Museum, garden, park and a bite to eat in the restaurants in or around the park make for a great day out! 87 Van Gogh paintings, drawings and prints (plenty of other artists too). Beautiful setting in a national park. There are hundreds of sculptures in the gardens and you can use your bike to get around them. Cheaper to park outside and get on one of their free bikes. Nice coffee shop in the museum. Plenty to see. There is also a modern art display which can be fun. Great idea, free bikes at the park entrance to bike ride to the museum (10-15 min). Museum is nice, great collection. Do not forget to visit the sculpture garden. The Cafe in the garden looks nice, service is very slow. Great museum in a great park. The Van Gogh collection is sublime, and so are the other pieces in the permanent collection. A bit of everything, but all beautiful, providing an excellent overview of the evolution of art. I often bring foreign guests here, and they all love it. The combination of the museum, park, wildlife and free bikes is unique.